Recent years have witnessed a dramatic growth of Chinese learners worldwide and a need for cross-linguistic research on Chinese literacy development. Drawing upon theories of visual complexity effect (Su and Samuels, 2010) and dual-coding processing (Sadoski and Paivio, 2013), Dr. Li-Jen Kuo will present a study that investigated (a) the effects of character properties (i.e., visual complexity and radical presence) on character acquisition and (b) the relationship between individual learner differences in radical awareness and character acquisition. Participants included adolescent English-speaking beginning learners of Chinese in the U.S. Following Kuo et al. (2014), a novel character acquisition task was used to investigate the process of acquiring the meaning of new characters. Theoretical and pedagogical implications of the findings will be discussed. Dr. Li-Jen Kuo is Associate Professor of Literacy Education and Second Language Acquisition in the College of Education and Human Development at Texas A&M University, USA. Dr. Kuo also serves as the Director of Texas A&M’s Chinese and Korean Language and Culture Program, a service program funded by US federal grants. Dr. Kuo received her M.A. in Language, Learning and Policy from Stanford University and her Ph.D. in Educational Psychology with an emphasis on Cognitive Science of Teaching and Learning from the University of Illinois at Urbana-Champaign. She was a Postdoctoral Research Fellow of the US National Academy of Education. Dr. Kuo’s research focuses on the interface among literacy, cognition and learning. She has directed several national and international research projects that investigate how different aspects of literacy development, ranging from the emergence of phonological awareness to the acquisition of argumentative discourse, vary across learners of diverse first and second language backgrounds. Her research participants included Chinese-, Korean-, Japanese- and Spanish-speaking learners of English as well as English-speaking learners of Chinese, Korean, Japanese and Spanish. 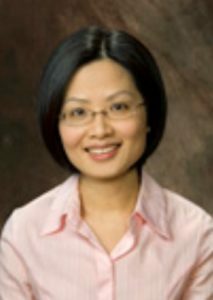 Dr. Kuo’s research has been funded by the US National Academy of Education/ Spencer Foundation and American Psychological Association. Utilizing both experimental and naturalistic methods, her research aims to advance theories of biliteracy development and to inform educational practice. Dr. Kuo has been publishing her research in high impact journals and her work has been widely cited in the fields of educational psychology and applied linguistics (Google Scholar Citation: 1.780; h-index: 14; i10-index: 16).